You should all know that you need to stretch, whether you are a chronic sitter, a weekend warrior, or a daily exerciser. Stretching helps your blood reach your muscles and your joints move through their full range of motion, but it also improves your posture and athletic performance and reduces the risk of injuries and pain. 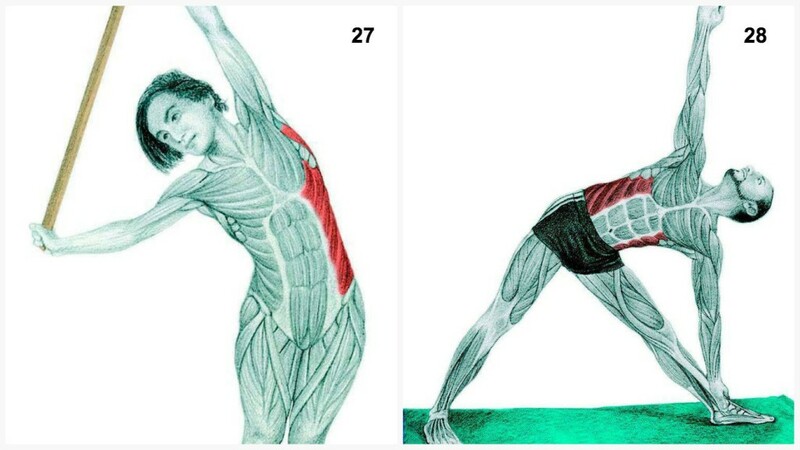 How do you know which muscles you are actually stretching or if you are performing each stretch the right way while you do yoga or the flexibility routine? Well, here is a little knowledge on the topic, and having this in your back pocket, you can opt for the best stretches that best fit your goals. In case you start feeling pain, and not the regular, good pain, but the stretchy one when you know that something does not feel right, you should pinpoint the muscle that gives you the trouble and change the technique you have been using in order to avoid getting injured. 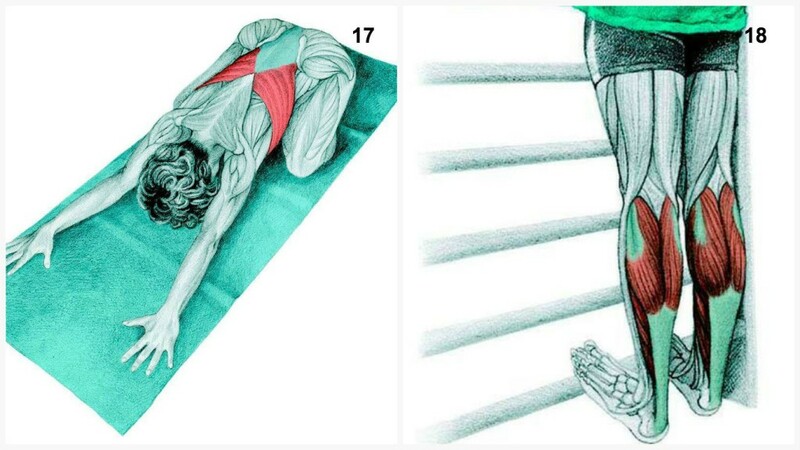 These stretches should be felt in the belly of your muscle. However, you should not feel pressure or strain in your joints, and if you do, it means that you are pushing too far. During the stretching, concentrate on your breathing and make sure these movements are as natural as possible. Stop thinking about the time you are holding the stretch, but instead, start concentrating on feeling your muscles relaxing and returning to their natural, resting length. This may take about five to thirty seconds. If a stretch does not feel like it is doing something for your body muscles, change it and try another one. 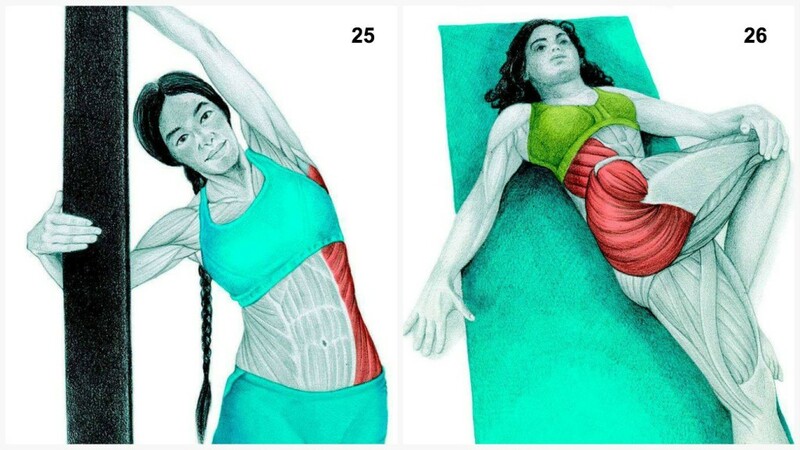 The beautiful illustrations we present you are made by Vicky Timon, a yoga expert and author of “Encyclopedia of Pilates Exercises”, and James Kilgallon, CSCS, creator of Mazio’s Body Maintenance Program, contributed by giving the expert commentary. Muscles emphasized: Rectus Abdominus and External Obliques. This stretch is though most appropriate for people who already have a good flexibility. Sitting on your heels, put your hands behind you, pushing your hips up and forward. Do not put too much pressure on your lumbar spine. Also, in case you have problems with your neck, do not drop your head back. Muscles emphasized: adductors. This exercise is great for stretching the adductors and the hamstrings, and you just need to open the hips. Start with your knees bent, holding your spine straight. As you start feeling your muscles starting to release, straighten your legs, round out your back and reach for your feet. Pull easily on the bottom of the balls of your feet in order to release the calf muscles. If you are beginner, you might not be able to reach your feet, so then you will need to use a belt or a towel. This stretch can also be performed while you lye on your back and push your legs up the wall. Muscles emphasized: adductors. This stretch for your groins can put pressure on your knees as well, so it is recommended that you perform it on a soft surface. Rest your hands and knees, and then bring your knees wider until you feel your groin muscles well stretched. You will feel a bit differing stretches as you actively push your hips back and forward. Muscles emphasized: adductors. Begin by putting your both feet forward in a wide stance, holding your legs as straight as possible. With your hands, walk to your right foot and then bend your right knee and rotate your left toes up to the ceiling, sitting in your right hip. Make sure your right foot maintains flat on the ground. Muscles emphasized: adductors. Sitting, bring the soles of your feet together and sit tall through your sit bones. Develop this stretch by putting pressure on your knees, using your hands. If you want to stretch your groin muscles better, hold your feet closer to your body. Now, make sure your feet are far from your hips and slowly round your upper body to loose your back muscles. Muscles emphasized: Forearm extensor. Pack your shoulders and your back down and rotate the shoulder towards outside in order to get into the optimal position to stretch the forearm muscle. After you have managed to bring your body into this position, put pressure on your other hand to start the stretch. You can develop this stretch by touching the tips of your fingers together in the shape of a tea cup. 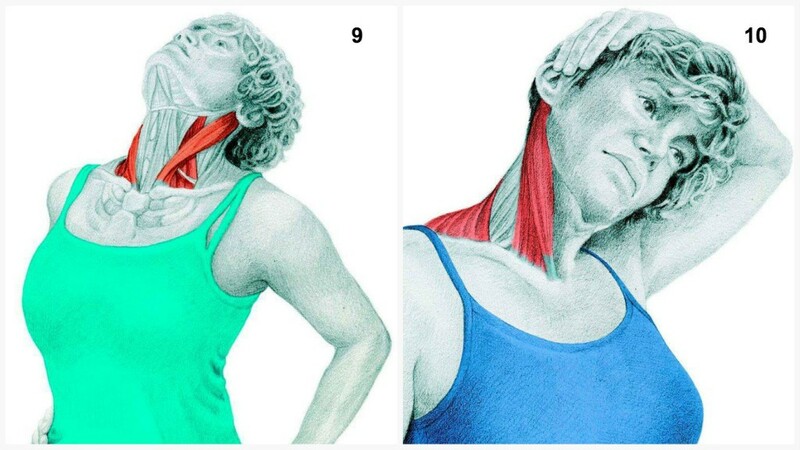 Muscles emphasized: sternocleidomastoid “SCM”. Prolong your neck as much as possible and slowly drop your ear to your shoulder, ensuring that you are not collapsing your cervical spine. This stretch can be further developed and advanced by sitting on a chair and holding onto the bottom of the seat. This is going to make the tension down your arm and neck consistent, and thus it will let you target the upper traps. Muscles emphasized: sternocleidomastoid “SCM”. Begin by rotating your neck in a slow manner, while keeping your chin a bit elevated to isolate the SCM. For a deeper stretch, you will need to put pressure with the opposite hand from the direction that you are rotating. 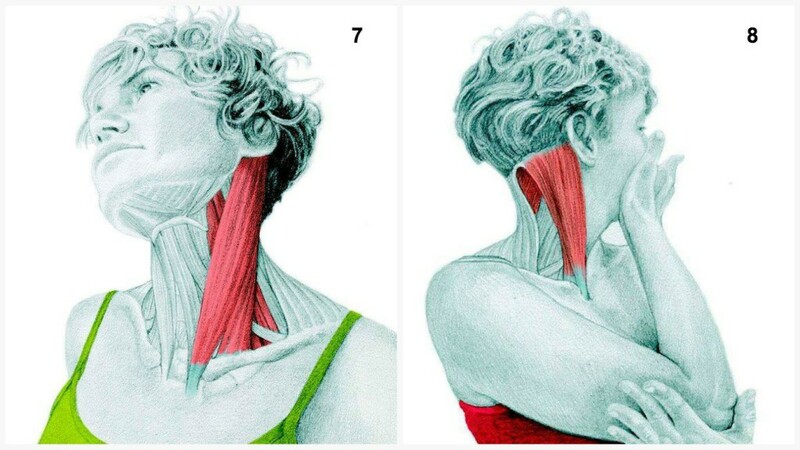 Muscles emphasized: sternocleidomastoid “SCM”. Begin by putting your hands on your hips, and in meantime, keep your spine long start to tilt your head back, ensuring that you are not collapsing your cervical spine. Muscles emphasized: sternocleidomastoid “SCM” and upper trapezius. Prolong your neck as much as possible while you slowly drop your ear to your shoulder. While you do this, make sure you are not collapsing your cervical spine. Advance this stretch by sitting on a chair and grabbing the bottom of its seat. In this way, you will create consistent tension down the arm and the neck, and it will let you target the upper traps. Muscles emphasized: psoas and quadriceps. Begin in the position of half-kneeling. Then you should bring forward the right hip, and you should also start feeling a stretch in the front of your hip while you do that. Take your back foot and squeeze your back glute in order to add to the stretch on your hip flexors. Muscles emphasized: forearm extensor. Begin by packing your shoulder and your back down. Next, rotate your shoulder towards outside to get into the optimal position to stretch the forearm muscle. When you have come into this position put pressure on your opposing hand to start the stretch. You can advance this stretch by touching the tips of your fingers together in the shape of a tea cup. Muscles emphasized: side deltoid. With your arms across your body, put pressure on your arm to add to the stretch on your shoulder. Muscles emphasized: trapezius muscle. Stand on the ground with your feet together. Make sure your spine is prolonged and slowly sit your hips back and round your upper back, pushing your chin to your chest at the same time. Muscles emphasized: latissimus dorsi. Begin by taking a firm grip on a bar and slowly lifting your feet off the ground. The stretch needs to be felt in your chest and lats. In case you have totally taken your feet off the ground, you will feel traction in your lumbar spine. If you have recently undergone a shoulder injury or you have impingement of the shoulder, do not perform this stretch. Muscles emphasized: latissimus dorsi. Put your both hands on the corner of a wall or post. Maintaining your spine prolonged, push your hips out to the side in a slow manner. If you have problems with your lower back, do not perform this stretch. Muscles emphasized: latissimus dorsi. Being on the ground with your hands and your knees on the floor, slowly bring your hips back until your forehead is on the floor. If you want a better stretch in your hips, you should bring your knees wider. 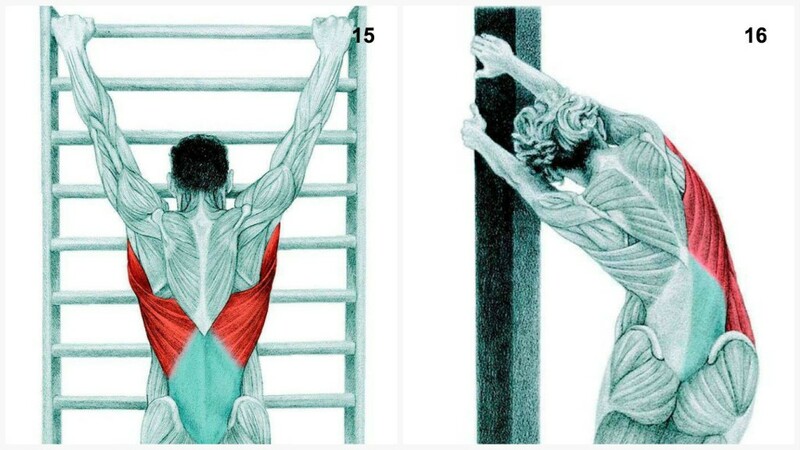 Your upper back should be positioned in the shape of an arch, and then you should externally rotate your shoulders to stretch your lats and chest muscles. Muscles emphasized: soleus and gastrocnemius. This stretch can be performed on a rack or on the edge of a stair step. Rotate your ankles a bit towards inside and outside to actively stretch your calf muscles. Muscles emphasized: psoas and hamstring. This stretch is not suitable for beginners, as it is kind of advanced, and it should be performed with caution, especially if you have any hip problems. Begin in a position of kneeling lunge. It can also be beneficial if you have the support of a chair while your hip flexors and hamstrings release. Muscles emphasized: hamstrings and calfs. Sit into your seat bones and bend your knees if you need to. Your legs will become stronger as your flexibility gets better. Make sure your spine is as straight as possible, especially if you have back problems. This stretch can also be done lying down on the back, with your feet up the wall. Muscles emphasized: hamstrings. Begin by having your feet positioned one in front of the other. Keeping your back straight, bring your hands to your hips and start bending from the hips. Muscles emphasized: glutes. 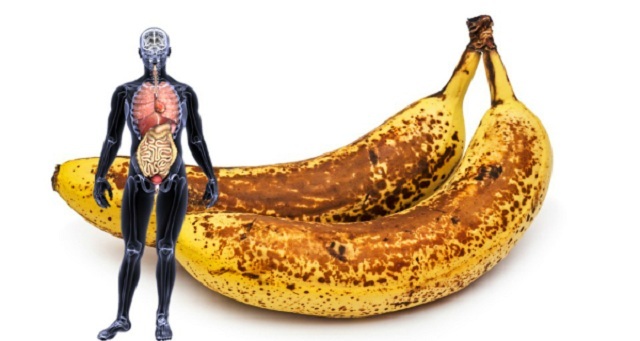 This movement has general impact on all areas of your body. If you have problems with your knees, or if you cannot keep your heels on the ground, perform your squat before proceeding. Begin by standing with your feet apart in the width of your shoulders and then start gradually lowering into the deep squat. When you get to the position of deep squat, bring your arms inside your legs and put a little pressure to the inside of your knees, sitting into the hips and heels. This stretch can also be performed lying on the back with the feet against a wall. Muscles emphasized: glutes. Begin in a seated position and gradually pull your leg to your chest and rotate your hip towards outside, while keeping your spine straight. This stretch should be felt in the glute. Muscles emphasized: soleus and gastrocnemius. Initiate in the lunge position, having the back of your foot a bit turned out. Gradually bring the back of your heel to the floor to stretch your calf muscles. Muscles emphasized: external obliques. Keep your spine prolonged and slowly push your hips outside. If you have troubles with your lower back, do not perform this stretch. Muscles emphasized: glutes and external obliques. 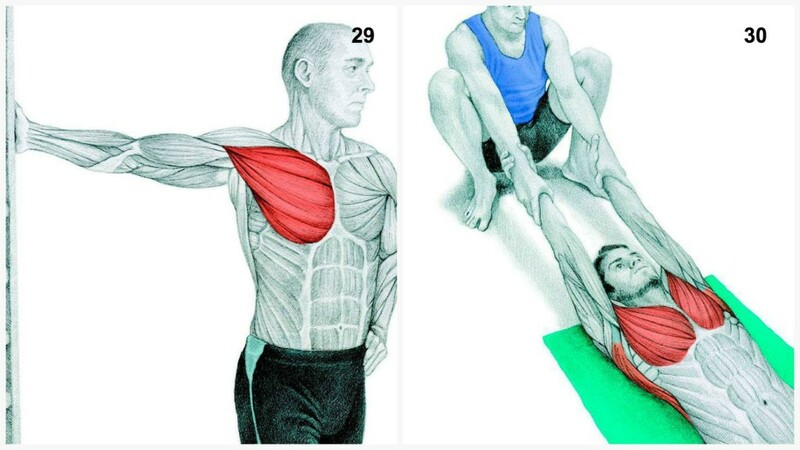 This stretch is especially good and beneficial for people who suffer from sciatica pain and try to get rid of it. Begin by lying flat on your back and then bring one leg across your body, and gradually rotate your gaze and upper body in the opposite direction. What’s important about this stretch is the fact that you use your breath to open up your rib cage and sacroiliac joint and hip area without putting too much pressure on the lower back. If this stretch is too hard for you, stack both of your knees on top of each other, and when you are positioned this way you will feel more stretch on the upper spine when the knees are higher, and more stretch on the lumbar spine when the knees are lower. Muscles emphasized: external obliques and latissimus dorsi. Keeping your spine long, gradually push your hips out to the side while keeping your shoulders rotated outwardly. 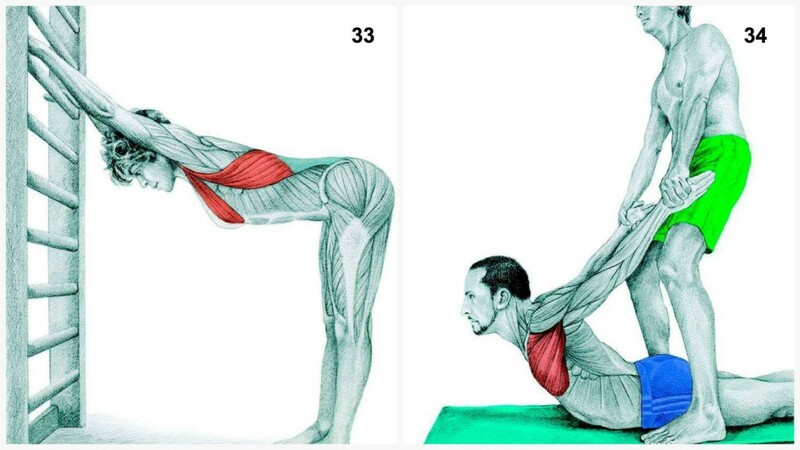 In case you have problems with your lower back, do not perform this stretch. Muscles emphasized: external obliques. Begin with a wide stand and with your front foot straight ahead, and your back foot at 90 degrees. Put your hand on your front leg or on the floor, and sit back into your front hip, keeping your back straight. Rotate away from your front leg and maintain your look on the hand that it is in the air. Muscles emphasized: pectorals. For starters, face the wall with your thumb up. Gradually rotate away from the wall in order to stretch your chest muscle. 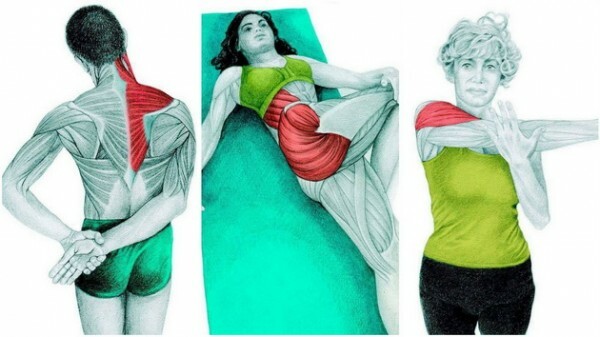 This stretch should be felt in the belly of the muscle, but be careful not to stretch too far, as it will result in a pain in the shoulder joint. Muscles emphasized: chest and latissimus dorsi. Begin by lying down on the floor and holding your palms faced up. Your partner should be seated in a deep squat and hold your hands, thus, you are supposed to feel a stretch in your chest and lats. The stretch should also cause some traction in your spine. 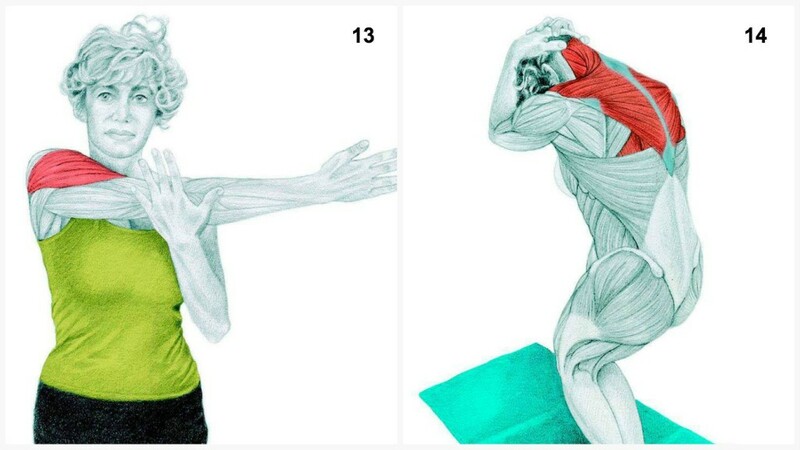 If you have shoulder impingement, do not perform this stretch. Muscles emphasized: anterior tibialis. Begin by sitting with your feet positioned in front of you. Put one hand behind you and rotate your hip outwardly and put one foot above your knee. If you want to add to the stretch on your hip, gradually lean forwardly and start the movement by hinging at the hips. Muscles emphasized: subscapularis. Begin by lying flat on your back. Then, place your arm straight out to the side with your elbow at an angle of 90 degrees. Next, gradually bring the back of your hand to the floor. If you cannot bring your hand close to the floor, and it is still far away, it means that your rotator cuff and other muscles that control internal rotation are tight. Muscles emphasized: pectorals and latissimus dorsi. Stand far enough from a wall or rack so that when you touch the wall your body gets into parallel position to the ground. Move into this position by pivoting at the hips and make sure your spine is straight all the time. Once in this position, move your chest forward and make a slight arch in your upper back and stretch your lats and chest muscles. If your hamstrings are tight, try bending at the knees. Muscles emphasized: pectorals. Lye down on the floor with your face down and your palms faced down. 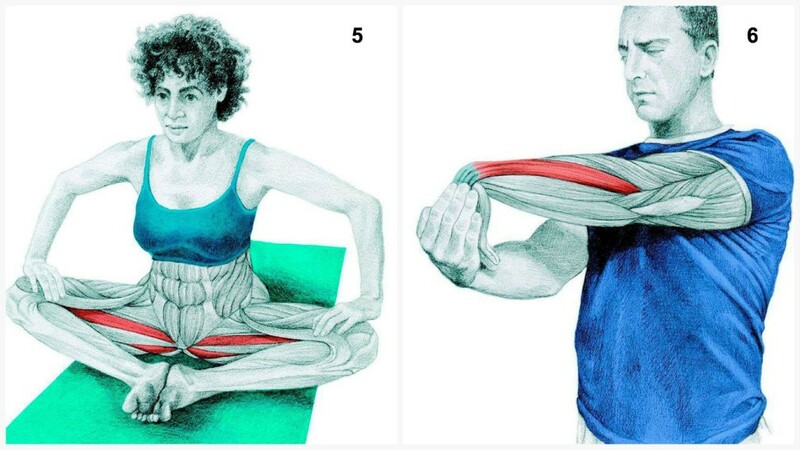 Your partner should pull your hands back and you should feel a deep stretch in your chest muscles. In case you have a shoulder impingement, do not perform this stretch.